When Turnbull threatened a double dissolution election over workplace relations, the press gallery all agreed (thanks for the link @boozebum) it was a masterstroke in wedging Labor, unprepared and with a lacklustre leader. Traditional media all agreed that 'Mediscare' was a scare campaign, but seemed to take recent Coalition campaigns against carbon pricing or the Budget deficit at face value. In the last week of the campaign, traditional media were all agreed the Coalition would be returned with a slender majority. When Bill Shorten told Leigh Sales that he hadn't given up, Sales laughed in his face. 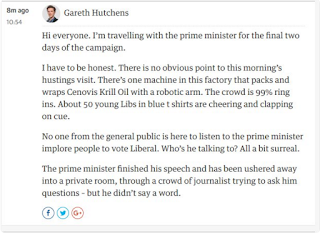 The same people who believed Turnbull ran a disciplined, on-message campaign now accuse him of being 'lacklustre', a term fed to them by Abbott and Credlin, and which shows they have no ability to assess or qualify lines they receive - so, what they pass on isn't valuable. Jenna Price's extraordinary article on how changes to Medicare have real-world effects on your healthcare. Now that Lenore Taylor has moved to an editorial role, Tingle is the best and most consistently journalist in the press gallery by a very long way. Price is not even in the press gallery; she's a columnist and academic, and seemingly by accident she's done some journalism when all other alternatives were exhausted. Unlike 1972, campaign-trail journalists have the ability to research and knock up stories from buses or layovers or wherever else that are every bit as good as those two above. 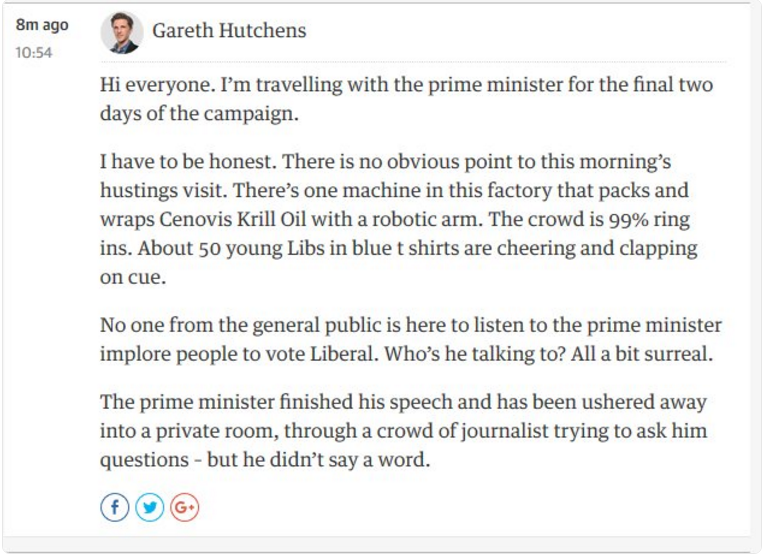 If the press gallery and the campaign trail produced consistently good journalism, it might be worthwhile - but it doesn't, and it isn't. Journos often moan that I don't call out positive examples: but when I do it only emphasises what dreadful garbage they have flung at us over the past eight weeks, and for years and years before that.